Disconnected Jottings from Alsace: Wot, no Bramleys? Unlike many expats, we are not constantly yearning for stuff from 'home'. I can easily manage without Marmite, Jelly, Horlicks or Dairy Milk. And we can find un-French favorites like Worcester Sauce, Custard Powder or Salad Cream, in speciality shops & increasingly even in hypermarkets. But one thing still eludes us. 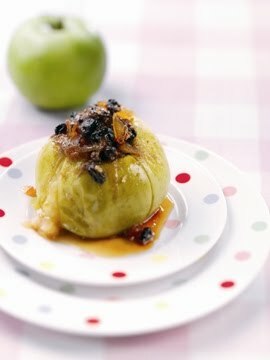 Of course, the French cook with apples. Apple tarts are common & at least look delicious. But the apples usually stay as firm slices & are only moderately tasty. Nothing like a good mushy, tangy Bramley Apple Pie! We never found a Bramley in a shop. We have some in the freezer. So we can still treat ourselves, but need to ration it. I have occasionally wondered if I could grow my own, but vaguely assumed that if there are none, that probably means they are not well adapted. But I found a couple of sites suggesting they can ship young trees to France & have asked their expert opinion. Now waiting for more info.